A guide for designers to learn fashion figure drawing. 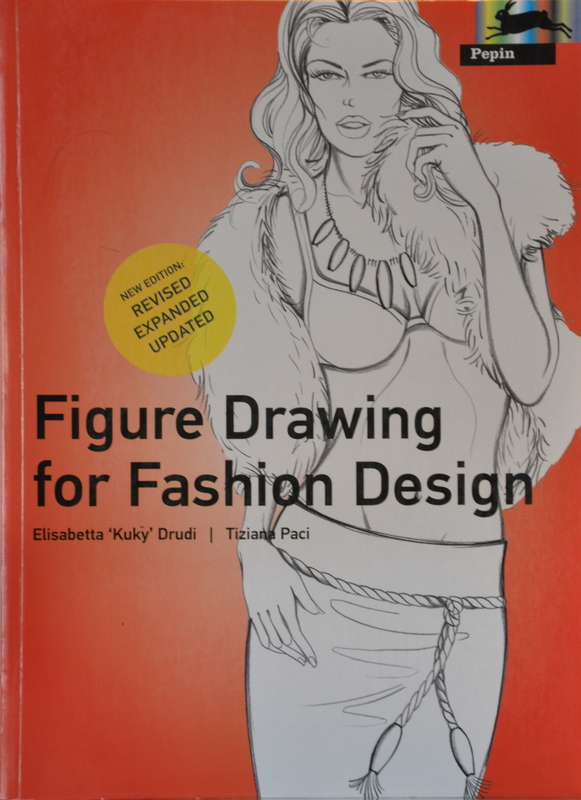 I picked up this book on Amazon about a week ago in hopes that it would help me develop my fashion sketching skills. It is filled with masterful drawings and brief instructions to guide you through the growth process necessary to become proficient in fashion drawing. To give you a little background, I have had fairly extensive training as a draftsperson. I have participated in 4 different drafting and technical drawing courses and have become reasonably competent in this area. I thought that having taken the classes would be an asset to me with regard to moving into the realm of creative drawing, but man was I wrong. I am by nature a perfectionist, so every pen/pencil stoke is very deliberate and precise. My training only amplifies this tendency, as technical drawings must be precise. This is not how creative sketching is done. The strokes are of a more whimsical nature. The grip you have on your drawing tool should allow for someone to come pull it out of your hand without feeling any resistance when they do so. I hold onto my pencil like The Hulk is trying to rip it away. Needless to say, I have a lot of work to do. 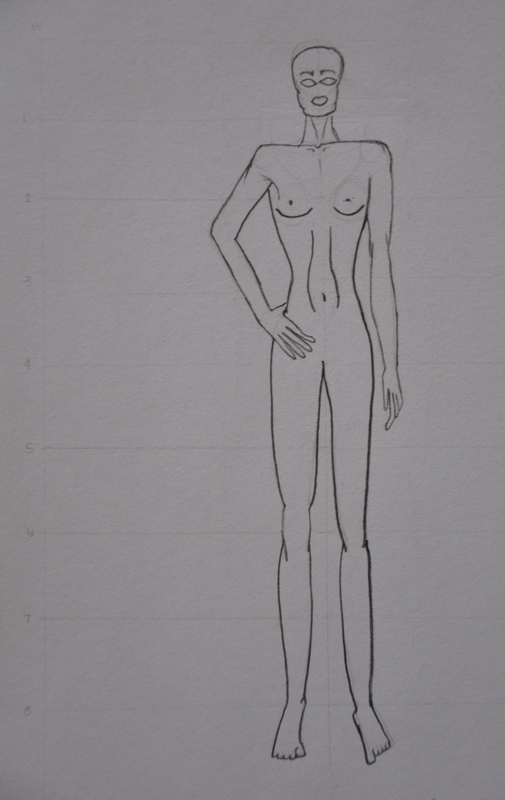 My first attempt at sketching a fashion figure. This is a photo of my first go at drawing the female figure. Well, one that doesn’t consist of a triangle, a circle and a few sticks anyway. I feel like I did pretty well at it. I struggled with the fingers. They came out looking more like eagle talons than human appendages. And I didn’t know where to begin when it came time to draw the head. An oval is all I’ve got for now. In fashion drawing the feet are drawn in a ballet-type stance to accommodate the high heels you will inevitably draw on the shoes. This drawing was completed after reading a lesson in the book. The book starts you off with drawing a figure without clothing. This is so you get a feel for the shape of the body and how to work with it under the clothing you draw. It’s difficult to see in the photo, but I’ve drawn lines to mark the proportions, which are based on the head. What this means is that the body is broken up into 8 sections, each equaling the length of the head. It’s actually 8 1/2 total because the feet are equal to half the length of the head. Phew. You with me still? The fashion figure’s waist is cinched in more tightly than if you were to draw a normal female figure and the legs are slightly elongated to account for the look most models have. I was hoping that my drawing ability would improve- even if only slightly -when I went through one of the lessons, but it seems to have gotten a little worse. I believe that this is because I am over thinking things. My husband and I joke that if Aqua Man had a girlfriend, this is probably what she would look like. The lead weight I chose was also far too heavy. I chose a 5H to do the original sketch in and then went over it with a 4B to clean up the lines. A 4B lead weight is way too heavy. If you’re going to do this I would recommend choosing nothing heavier than a B to finish up your drawing. I wanted to post this so you can see what things are like in the beginning; messy and sometimes frustrating, but keep practicing and you’ll only get better….we’ll only get better. This entry was posted on Thursday, May 12th, 2011 at 12:08 AM	and tagged with fashion, fashion design, fashion drawing, fashion sketching and posted in Fashion Design. You can follow any responses to this entry through the RSS 2.0 feed. Ha! That’s a really funny way to put it, but it’s true. I would prefer to develop a more abstract style of drawing fashion figures. I think you’re right. It makes it easier to focus on the clothing when you’re not looking at an illustration of a stunning woman. I would love to see some of your stuff. I’m not sure if you have it on your page or not. I tried to get to you through your username link, but it is not working for some reason. I was told that mine was not working properly either earlier today. I’m not sure what’s going on with that. I think it’s more fun to look at abstract fashion illustrations:) although it’s not what I made now. I have some pictures on my page from the project we are doing at school. hope… to see it also.. because i have a hard time when it comes to sketching:( i think it can help me..